Despite its grand stature, the cathedral of Dol-de-Bretagne is an oddity. Where two towers should clearly stand there is just one, with the second abruptly ending in a perfect diagonal line. It’s as if the top has been neatly sliced off with an over-sized kitchen knife and consumed by a Brittany giant. Or perhaps the local builders learnt about the abbey at Mont-Saint-Michel, half an hour away, and decided there was simply no point in finishing. After all, it’s tough to compete with what is, undeniably, one of France's most famous seaside monuments. Just outside the pretty medieval town, Dol’s local campsite is far from unfinished however. 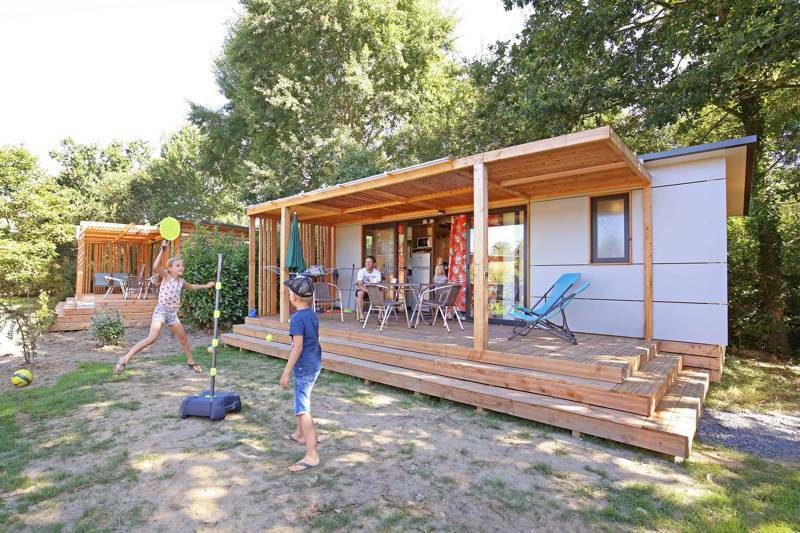 Spread across a vast, grassy area, complete with a pair of lakes at either end and a scattering of wooden chalets, Huttopia Baie du Mont Saint Michel is a campsite with facilities at the fore. While almost every camper here will be taking the 30-minute trip to Mont-Saint-Michel and scampering across the sands of Brittany's most famous bay, the campsite has still ensured there’s enough on-site fun to occupy you for hours. There are two swimming pools, a spa area with a hot tub, water-slides, a pizzeria, a playground and three different wash-rooms, each with family-friendly facilities and disabled access. With over 100 different pitches, too, it’s certainly a campsite at the larger end of the scale. Yet, despite the commercial size of Huttopia Baie du Mont Saint Michel, it remains an undeniably beautiful place to stay. The proximity to Brittany’s best attractions, the handy location within range of Saint Malo’s ferry port and the setting itself, broken up by trees and foliage to give a deceptively smaller feel, give it a thoroughly enchanting appeal. For families in particular it is a boon. 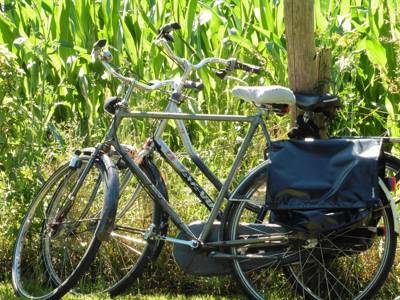 You can bring bikes on the back of the car and pedal the charming old streets of Dol-de-Bretagne before cooling off at a nearby beach or you can head to the historic sites of the D-day landings and the museums in the ancient centre of Saint Malo city. For many, meanwhile, the campsite works well as a temporary stopping point en route to or from destinations further south. A place where kids can let off that last bit of steam before heading sullenly back home from their holidays. Unwind in the heart of Brittany, between Mont Saint Michel and Saint Malo. 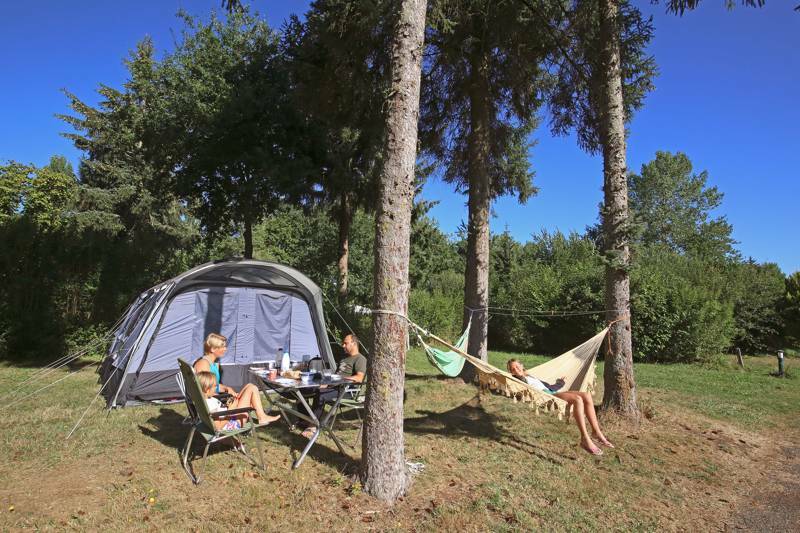 In the midst of nature, on the banks of the lake, enjoy a holiday in the countryside at Baie du Mont S Michel campsite on one of the spacious pitches or in fully equipped rental accommodation if you like your creature comforts. Sightseeing, walks, traditional cuisine, swimming, and family activities all await you for active holidays in the heart of magnificent landscapes. On site, enjoy quality services: food services, heated swimming pool, slide, spa area, paddling pool, laundry area, playground. Baie du Mont St Michel campsite offers quiet, shady pitches, 80m2 to 100m2 in size, where you can set up your tent, caravan, or motorhome. All the pitches have electricity, you just have to choose your favourite spot. Three heated washrooms with showers, sinks, and baby areas are available for your use, one of which has been fully renovated. Accessible to people with reduced mobility. For latest availability and best prices for Huttopia Baie du Mont Saint Michel, please use the Date Search above. Around 100 pitches across 12 acres, plus wooden chalets and statics. 3 wash-blocks with toilets, showers, washing up sinks, disabled access and baby changing areas. 2 swimming pools, 2 paddling pools, water slides and a spa area, plush a huge lake with fishing permitted. Snack bar and pizza restaurant (open during July and August). A central lodge with free Wi-Fi, a TV room, library and board games; a playground, tennis courts, football pitch, pétanque pitch and table tennis tables. Tourist information in reception. BBQs and fridges for hire. Coin-operated washing and drying machines. Motorhome service point. Activities for children throughout school holidays. The local medieval town of Dol-de-Bretagne has a huge 13th-century cathedral – la Cathédrale de Saint-Samson (0033 2 9948 0048) – plus a famous, 12th century granite home – Maison des Petits Palets – now with a small shop inside. The cathedral is renowned for its varied mix of styles and includes and incomplete north tower, built in 1520. Local myth has it that the top was knocked off by the devil, who threw the town's monolithic stone at it. The stone, known as a menhir, is also an attraction in itself, a ginormous pointy pebble weighing some 150 tons. Head further north to the Brittany beaches and the chance to feel the sand between your toes. It's around 30 minutes from the campsite to famous Mont-Saint-Michel, a rocky island settlement surrounded by a magnificent bay that has been a UNESCO World Heritage Site since 1979, while the old town of St-Malo is also just half an hour in the car. Fresh bread is delivered to the site each morning (make sure you order the evening before). Restaurant Auberge de la Cour Verte (0033 2 9948 4141), known in English simply as 'The Green Court Inn' is the local restaurant of choice. Housed inside an utterly charming 18th-century farmhouse, the food is top notch and the wine is typically French and superb. There's a nice terrace and garden outside too, and they have a children's menu. Late April – end of September. Camping from €24.70 per night, including a pitch, 2 people, a vehicle and a tent or motorhome. Additional adults €5.10–€7.60; children (2–7yrs) €3–€5.50; under-2's free. Pets €5. Extra car €3. Glamping accommodation from €47 per night. Leave the N176 at signs clearly marked for Baguer-Pican. Follow signs into town then simply follow the tourist signs for the campsite: Huttopia Baie du Mont Saint Michel. It's 5km to Dol de Bretagne train station, it is part of the TER line Rennes–St Malo. The nearest airport is in Rennes, about 1 hour from the campsite, but the ferry port of St-Malo is only half an hour away, making it very easy to come here from the UK by car.